In a saucepan whisk together the soy sauce, mirin and sugar and bring the mixture to a boil over moderate heat. Simmer the mixture for 5 minutes, or until the sugar is dissolved, and mixture begins to thicken. Set aside. Thread chicken and green onion segments onto skewers in alternating fashion, 3 pieces each per skewer. Preheat a grill or barbecue to high heat. Brush skewers liberally with sauce. Grill skewers for 2-3 minutes per side, until grill marks appear and chicken is cooked through. Baste skewers with sauce several times while grilling. Serve immediately. Thread eggs carefully onto skewers, 3 eggs per skewer. Preheat a grill or barbecue to high heat. Brush skewers liberally with sauce. Grill skewers for 1 minute per side, until heated through. Baste skewers with sauce several times while grilling. Serve immediately. 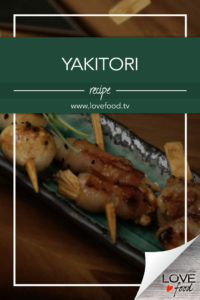 Wrap mushroom ‘cluster’s’ in bacon and thread onto skewers, 3 per skewer. Preheat a grillpan or barbecue to high heat. Brush skewers liberally with sauce. Grill skewers for 2-3 minutes, or until bacon is cooked through. Baste again while grilling. Serve immediately. 15cm skewers are what I have on hand. Use any size skewer available, but the smaller the better. Each skewer is supposed to hold a small amount of food so you can eat copious amounts!